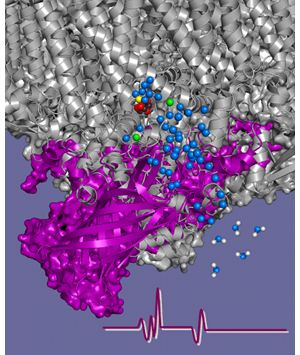 Work in the Barry lab is centered on two topics, the mechanism of proton coupled electron transfer in proteins and the mechanism of photosynthetic oxygen evolution. On the first topic, we are comparing proton coupled electron transfer reactions in ribonucleotide reductase and photosynthetic reaction centers. Ribonucleotide reductase is an essential enzyme in DNA synthesis and an important target of anti-cancer therapies. Photosystem II catalyzes the light driven oxidation of water to produce molecular oxygen. Based on these studies, we are building peptide models, which mimic these reactions. On the second topic, we are using UV resonance Raman and infrared spectroscopy to study how water oxidation occurs at the manganese-calcium metal center of photosystem II. We are investigating the role of extrinsic subunits in activity and assembly, and we have new information concerning the role of post-translational modifications in damage and repair. We are using a variety of biochemical, analytical, and biophysical techniques to elucidate these reaction landscapes. Methods employed include UV resonance Raman spectroscopy, FT-IR spectroscopy, EPR spectroscopy, and mass spectrometry.